Hi I'm Meg ! I have worked with animals, specifically dogs, for many years. 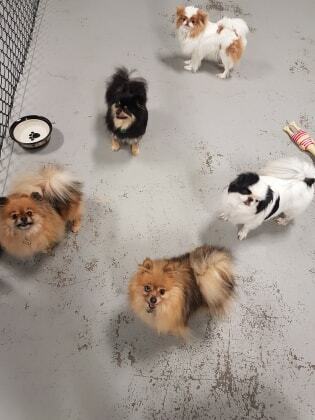 I have worked as a professional dog walker walking up to 10 dogs off leash and am currently working at a doggie daycare in downtown! I also do volunteering for adoption events and fostering of animals until they find their forever home! I have had a passion for caring for animals for many years, and it brings me great joy to ensure animals are happy and healthy. I have the most experience with dogs, cats, rabbits, reptiles and birds. I am experienced with dog and cat body language, and have had many scared rescues trust me relatively quickly ! I am quite small and gentle with a very non threatening energy which has a lot to do with animals trusting me. Clients are often surprised when their scared fur kid comes up and lets me pet them :) Even while working with rescues every day, I am always looking for new opportunities to interact with different types of animals and personalities, as well as curbing unwanted behaviour they may have. Pet sitting is the perfect role to fill as there are always new challenges, rules and pets to work with which makes a very rewarding experience. I offer visits where I can walk, feed, water, play with your pet in the comfort of their own home while you are away. I have experience in administering medications to your pet as well if needed. I have provided pet services for 3 years and have never had an unhappy client. I enjoy bonding with your pets as I do with you ! Please do not hesitate to contact me if you think I'm a great match for your fur-kids ! Megan is one of the best dog sitters we’ve had. She is very professional. We had a meet and greet to see if she was a good fit for us and our dogs. During that initial meeting, Megan had come prepared with comprehensive questionnaire to get to know us and our dogs better. She asked about their routines, likes and dislikes, rules and boundaries and even our training style. We were very impressed with the thoroughness of her questions and her diligent note taking. She was personable and great with the dogs. This meeting left us with sense of confidence that our dogs would be well cared for while we were out of town. While we were away, Megan kept us up to date with our pups and wasn’t afraid to ask questions. This made us trust her even more, and it put our anxieties at ease. Upon returning from our trip the dogs were happy and healthy, and our house was spotless and in better shape than when we left it! Thanks Megan for taking such great care of our dogs! Megan stayed with our two Labrador retrievers for almost 3weeks and I can’t say enough great things about her. I was extremely impressed from our first meeting. She asked questions and made notes about the specifics of each dog. They were out everyday for walks and were very settled and content when we arrived home. During the stay she communicated regularly to give us updates or ask questions. The house was clean and everything in order when we arrived home. Thanks again Megan. Being a dog walker has given me a lot of skills working with pets. I have developed useful techniques in remaining the leader of the packs I walk using positive reinforcement. This ensures a happy and stress free time for everyone. Working in a rescue I have a lot of experience in dealing with challenging dogs. Most of the dogs that arrive at the rescue are very fearful and uncomfortable. It is my job to teach them to trust people, curb poor behavior, teach good manners as well as take care of their basic personal needs such a walking, feeding, watering and giving medications. I am always on the look out for medical problems that need to be addressed to ensure the health of the dog and others around it. I have a lot of experience when caring for other pets as well which can range from rodents, reptiles, amphibians, small birds, cats and dogs. I have fostered 2 pregnant rabbits as well as many cats and dogs.